A Growing Interest in Corporate Collecting? Business to Arts are seeing the beginnings of growth in corporate interest and confidence in re-engaging with both collecting and displaying visual art in their buildings. We are currently engaged with 5 client companies developing ideas around bespoke visual art programmes. 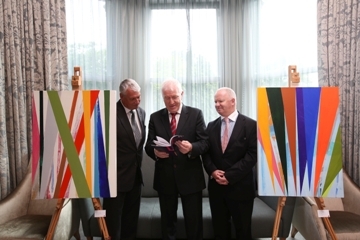 Just one of these, global insurance and reinsurance organisation XL Catlin, has recently confirmed a significant investment in more than 20 works by 17 artists currently working in Ireland. The purchase follows an Open Submission process and Exhibition at XL Catlin’s architecturally significant offices on St Stephen’s Green, Dublin. No stranger to the arts world, XL Catlin insures some of the leading galleries, exhibitions and art collections around the world. The Group convened a selection panel to consider over 500 submitted works, which included local art experts Sean Kissane, Curator, Exhibitions, Irish Museum of Modern Art and Rayne Booth, Programme Curator, Temple Bar Gallery & Studios, along with local staff and XL Catlin’s Jennifer Schipf, Vice President of Fine Art & Specie. The purchased works will be installed at the company’s offices, and artists selected range from undergraduate to senior artists and span 22 to 60 years in age. The artists are based in Dublin, Belfast, Galway, Sligo and Clare and include many artists of note including Alice Maher, Nick Miller, Mark Joyce and Garrett Phelan.